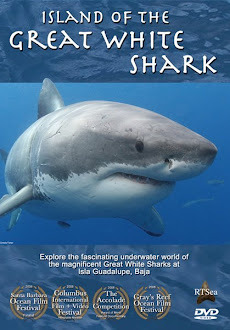 Shark Diver : Shark Diving : Swimming With Sharks: Familiar Sharks Crash Party! After a flat calm crossing, we arrived at Guadalupe Island and awoke to a beautiful sunrise. 150 + ft. visibility, no wind and bright sunshine made for perfect shark diving conditions. After the first couple of rotations, everyone had seen their first shark and we ended up being visited by at least 7 individual sharks. Bite Face, Thor and Johnny stopped by again and Doby, a new shark from last season showed up to check out our divers. Today was even better. Jaques made an appearance early in the morning and stayed around for most of the day. What an experience to have a 16.5 ft. shark come by and look you into the eye. Johnny and Thor came back again, along with Thor and our very own ”Horizon”. I have to say that Horizon looks a little beat up. He has his trademark triangular cut out of his dorsal fin and both the bottom and top of his caudal fin are cut. He doesn’t seem to lead a very careful life. 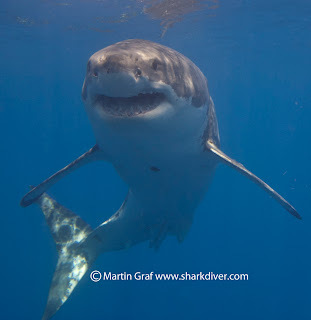 It never ceases to amaze me, that we see sharks like Jaques, Thor and Bite Face who have been around every year since 2001. Still no sign of Shredder though, I’m starting to worry about the guy. Hopefully, he’ll show up soon. The Horizon returns on Sunday, only to head back out that night to take another group of excited divers to the island. All have heard the story of Shredder. We're bringing the party to you, buddy. Now all you need to do, is attend! About Shark Diver. 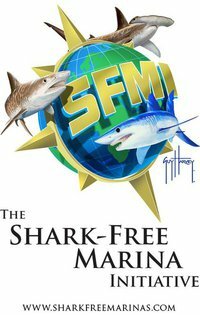 As a global leader in commercial shark diving and conservation initiatives Shark Diver has spent the past decade engaged for sharks around the world. Our blog highlights all aspects of both of these dynamic and shifting worlds. You can reach us directly sharkoperations@gmail.com. Love the post. So Bite Face... I can speculate about the name but where would a shark get a bite from? Another shark? Why?